The compact 12V heater by Wagan Tech. 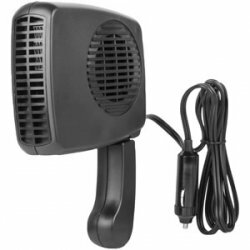 This portable heater is perfect for defogging windows, but it doubles as a portable hair-dryer. It can be mounted to the vehicle dashboard or used as a hand-held simply by folding out the built-in handle.